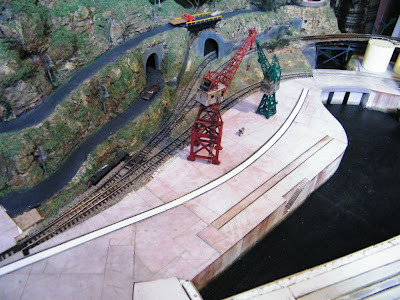 Wrightsville Port: N-Scale Waterfront Layout: The dock is ready for service! The dock is ready for service! In the last 2 and a half month, since my last post, it has been a tough time, deaths in the family, work pressure, itty-bitty issues cropping up here and there... I had also broken my beautiful Life Like GP 38-2 when I dropped it accidentally while cleaning it, breaking one truck completely, and causing severe damage to the shell and the railings. Thankfully, Wealthers obliged with a complete new truck assembly, though it did cost $20 for the tiny piece, and the loco is running as smooth as new, and I could successfully perform the 'plastic surgery' (literally!) to restore its looks. But hey, with all this, I still managed to make some significant progress and reached an important milestone for the project - I have concealed all the tracks in 'concrete' and finished the top surface of the concrete dock. It was a large surface to cover, and with this, a major task came to an end - a task that I started over 1 year back, and was halted due to several other reasons, but mostly because I was lazy! I had been covering up bits and pieces of area with Scalescenes paper concrete for quite some time, as you can see tracing back to the previous posts. This time I took the plunge to get the remaining portion done at one go. And I have to say it was a tough task, and while doing this, I did start questioning the efficiency level of this process of modeling in N scale, though I am sure it would work beautifully in larger scale. For the remaining large areas between the track and the dock edge/wall, first I took an impression of the area on a tracing paper, then transferred that on a piece of high grade, 500 GSM water color paper. I then cut out the contours and wrapped it around with the Scalescene printouts, then used matt spray varnish to ensure protection from weather. Then I glued it on the dock surface. If you notice, there were some area that I had actually covered early last year with normal white cardboard already, before discovering the Sclescenes product, for that area, I traced out the contour cut out the printout, and glue it directly on the surface. Once all the required are was covered, it was time to cover the area between the tracks - the tougher part of the task. I used 5mmX25mm, 1mm thick cardboard strips between the tracks as the main support and riser for the styrene strips I would use to cover the area between the tracks. Now the reason I used styrene, and not cardboard between the tracks because card boards tend to warp and bend with change in humidity, which can disrupt alignment and make the trains derail. Additionally, it's hard to do fine adjustment on card board when it's all glued down and installed - you can sand styrene, but not cardboard. The method of cutting the styrene was the same - first I traced out the contours of the rails, transferred that on a sheet of 1mm thick styrene using carbon paper, cut the piece out and glue it on top of the risers that are already installed. Now to ensure fine adjustment, I did cut one long piece in several smaller pieces while gluing them down. Here is the result. Now, may be it's not apparent in the picture, but the gap between the rails and the styrene edge is at least 1.5mm, and nearly 2mm where there are sharp curves. 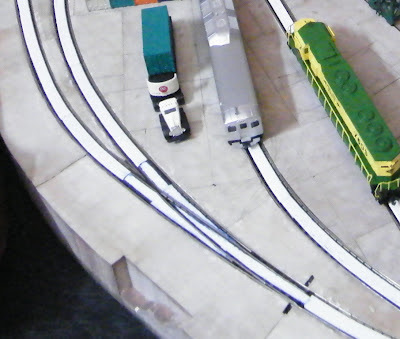 That gap is HUGE if you convert to 1:1 scale, but a necessity for N scale models because the gap between the flanges of the rolling stock and loco wheels will prevent you from keeping smaller gaps. Also, due to comparatively larger flange diameter of my locos, the gaps had to be increased unreasonably in the areas where there are comparatively sharper curves. And that's the reason I had drawn the conclusion earlier, that this type of scenery modeling is most probably not suitable for N scale, especially if you are not using state of the art fine scale models. Even those can just improve the appearance a little bit, but can never make it close to the prototype, I think. Now comes the most difficult part, the turnouts. I will cover this one in as much detail as possible, and with the below examples the lack of 'how to do' pictures in the above tasks will become clearer, I believe. First, I used a tracing paper to trace the contours. For each turnout, there are three pieces - 2 pieces between the frog and each diverging lines, that usually have the guard rails, and one longer piece between the moving rails. Note that while taking the print, I needed to trace out the actual area between the moving rails, so I had to trace the contours of the moving rails in both normal and thrown positions, and selected the common area. This is the area the rails don't touch in either of the position, thus the area that I can cover - I have darkened this area in the tracing below. Third, I had cut them using a good quality hobby knife and glued them in position. Note that I have not used any riser or support for the pieces for each diverging tracks. If cut in right dimensions, the larger area of the pieces between the frog and the guard rails should be able to keep the piece in position, and you should have a 'snap-fit'. The rail fastening chairs/clips have the perfect height for N scale to hold the piece in place without the risers. For the piece between the moving rail however, I had to use risers to level it properly, and as you can see, based on the actual area available between the moving rails, these pieces can be as thing as 3mm. When all pieces were put together, it looked like this. If you inspect closely, you will see the unrealistic gap between the moving rails and the styrene piece, but unfortunately, that is a necessary scarifice since my Peco turnouts move nearly 2 mm when thrown. So you deduct 4mm instantly, plus adjusted for the actual spacing between the inside rails, the width can vary from 3.5mm to a max of 5 mm - but not more than that. Once all the turnouts were covered, it looked like this. I tested all the tracks with all three of my motive powers - the 'Budd' RDC, the 'terrible shaker' Bachmann SD45, and the 'smooth kisser' LifeLike Proto GP38-2. They all run properly on these tracks, and I am hoping any new loco I buy, it should run OK as well, given the additional clearances I have maintained in difficult areas. After the tracks were cleaned and the trains started running, I couldn't help taking some additional pictures. ;-) Find them in Misc Photos Section, or in my Facebook Album. The first detailed video of the layout!